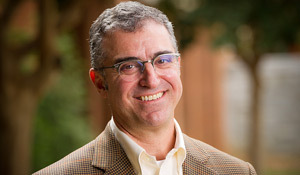 Justin Catanoso’s reporting has established him as an expert in fraud in the tobacco industry, the business economy in North Carolina, and the process of becoming a saint. Now Catanoso, a veteran journalist and director of the journalism program, is shifting his focus to raising awareness about global climate change. Catanoso traveled with a team of climate researchers from the biology department to the remote Peruvian cloud forest this summer to witness firsthand the impacts of 21st century warming on this vital ecosystem. He said that the experience working with Miles Silman, biology professor and director of the Center for Energy, Environment and Sustainability, and many of the world’s leading tropical biologists, who like Silman are part of the Andes Biodiversity and Ecosystem Research Group, helped him recognize the monumental importance of inspiring the current generation of world leaders to act on this issue now. Catanoso’s subsequent climate change coverage, supported by a grant from the Pulitzer Center on Crisis Reporting, has appeared in prominent news outlets like National Geographic, Business Insider, WUNC, and in a five-part series on WFDD.